Have I waxed poetically enough about how moving to Ireland meant downsizing? Get out your teeny, tiny violins. I’d say we got rid of 60% of Handy Husband’s our stuff. Start playing your sad tune now. The truth is, I don’t even miss Handy Husband’s most of that stuff. Even with all of that downsizing, I still knew storage would be a challenge. Think about all the stuff you store in your home – craft supplies, office supplies, Christmas ornaments, extra blankets, tools, all the shoes you can’t wear now that you have to walk everywhere, etc. My babies shoes! I can’t part with them. Yet. Homes in Ireland don’t have a lot of closet space – especially older homes. Most people store their clothing in armoires or wardrobes – not walk-in closets where there’s a lot of room to hide other completely frivolous items necessities. So, here is THE BEST storage purchase we made before we left. I actually wish we would have done this sooner. We found 18-inch tall bed frames on Amazon. And they have been a GAME CHANGER in the storage department. I cannot emphasize this point enough. We were moving furniture around the other day and that’s why I finally stopped being lazy took pictures to share this storage tip with you. The frame does fully fold up if you aren’t using it. Here’s my handsome model doing actual work demonstrating how the frame unfolds after he’s moved it from one room to another without his wife’s help. It’s light! He didn’t need my muscle! How’s that for great parenting thorough research and solid investigative reporting? The thing about this type of bed frame is that you DON’T need a boxspring. Well, you probably could put a box spring on it, but then it’s going to be a really, really tall bed. Plus, I’d worry about the boxspring slipping off. I thought it was going to be hard to dispose of a king and a queen boxspring (we did this switch up for 2 beds), but nope! 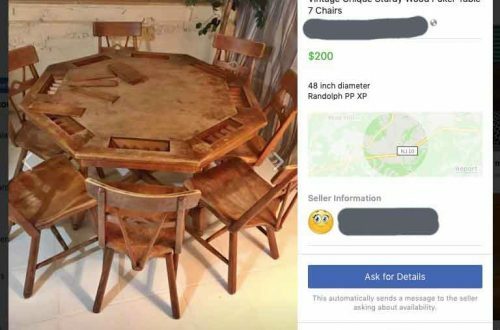 It turns out you can get rid of most anything for FREE on Craigslist. I swear our mattress felt better after we eliminated the boxspring and placed it on this new bed frame, but who knows for sure? Now, this is important. See the big brackets attached to the footboard in the below picture? Those don’t come with the bed frame, but we needed them to attach the frame to the headboard and footboard. They are made by the same company that makes the bed frame. Let’s get back to the amazing storage though because it’s the real star of the show. For a queen-sized bed, I can fit 8 of those large 18-gallon plastic totes under the bed with room to spare. EIGHT!!! That’s a lot of shoes! Kidding! I only have one of those with shoes. One-ish. I have even more storage under our king-size bed. And yes, I do use bed skirts to hide it all. It’s a crazy amount of storage and it’s really saved our bacon over here. I can think of one potential downside to this storage option. This particular bed frame is probably going to be higher off the ground than what you might be used to – especially when you factor in the depth of your mattress. So if you are vertically challenged, you might want to do some measuring before you go this route. For our particular household, this has been a purchase decision we are immensely happy with and would recommend to any of you who are looking for additional hidden storage in your home. I do love a good storage idea! Here are some others. Annisa, Thanks for featuring my Sewing Machine Drawer Kitchen Organizer! Yep…don’t really know where the idea for that one came from, but glad others are enjoying the repurpose-maybe they’ve got one laying around! I’m with you on the winery you featured…skip the wine, I just want that building! Thanks for linking back, too! Hi! It’s my absolute pleasure!! I think why it caught my eye is that we have an old treadle sewing machine in the family and we were just trying to decide what to do with it. My great grandma had written on a 3×5 index how she came to own the sewing machine, which is incredibly special to find after all these years – it was tucked way back in a drawer. The machine will go to a cousin, so it will stay in the family. But! the drawers are just like the drawer you turned into a tote. You are so clever! Love it!